The film was directed by Jennifer Yuh Nelson and Alessandro Carloni and written by Jonathan Aibel and Glenn Berger. Jack Black, Dustin Hoffman, Angelina Jolie, Lucy Liu, Seth Rogen, David Cross, James Hong and Jackie Chan reprise their roles from the previous films with Randall Duk Kim reprising his role of Oogway from the first film. They are joined by Bryan Cranston, J. K. Simmons and Kate Hudson in the roles of Li Shan, Kai, and Mei Mei, respectively. Kung Fu Panda 3 premiered on January 16, 2016, in Los Angeles. It received a limited release in China on January 23 for a special three-hour sneak preview and was released in the United States on January 29 in 3D. Like its predecessors, the film received generally positive reviews while grossing $521 million worldwide against its $145 million budget. In the spirit realm, Oogway fights against his old bull adversary named Kai, who has defeated all the other kung fu masters in the realm and taken their chi. Oogway too is ensnared and has his chi stolen, but warns Kai that the Dragon Warrior, Po, will stop him. Kai takes this as a challenge to steal the Dragon Warrior's chi and returns to the mortal realm. Meanwhile, Master Shifu announces his retirement from teaching and passes the role of teacher to Po. An initially excited Po realizes that teaching kung fu is not as easy as anticipated, and the Furious Five are injured as a result. Po is demoralized because of his failure, but Shifu advises Po that instead of trying to be like Shifu, he should try to be himself. Po returns home where he meets a panda, Li Shan, whom they both realize is his long-lost biological father. They quickly bond with each other, much to the jealousy of Po's adoptive father, Mr. Ping. After introducing Li to Shifu and his friends, Po and the Five defend the Valley of Peace from jade zombies that Kai has created from the chi of past kung fu masters. The team learns through research that Oogway and Kai were once brothers-in-arms. After Oogway was injured in battle, Kai carried him to a village of pandas who healed him with their mastery of chi. The pandas then taught Oogway how to utilize chi to help others. However, Kai wanted the power for himself and tried to steal the pandas' chi, forcing Oogway to banish him to the spirit realm. In order to defeat Kai, Po must learn to master the use of chi himself. Li offers to teach him by taking him to his secret panda village. While Shifu and the Furious Five stay behind to deal with Kai, Po and Li travel to the village. Mr. Ping comes along as a stowaway, worried that he will lose Po's affections to Li. Although Po is eager to learn chi, Li tells him he must first learn the relaxed life of a panda in the village. Kai takes the chi of nearly every kung fu master in China, including Shifu and the Furious Five except Tigress, who escapes to warn Po and the other pandas that Kai is coming. Afraid, Li and the pandas prepare to run away. When Po demands that Li teach him how to use chi immediately, Li confesses that he lied about Chi mastery and that he only brought Po to their village because he was afraid of losing him again. Po is hurt over his father's misdirection and isolates himself to train vigorously in preparation for fighting Kai. Mr. Ping, who realizes Po has become happier with Li in his life, tells Li that Po being mad at him is part of being a father, but that Po will forgive him. So Li goes back to Po, and says the pandas will help him fight Kai's army. Realizing what had previously made him fail as a teacher, Po agrees and teaches them to use their everyday activities as kung fu skills. Kai arrives and sends his minions to capture Po, who sets the pandas, Ping, and Tigress upon them, distracting Kai. They defeat the jade zombie army, but when Po tries to use his signature Wuxi Finger Hold on Kai to send him back to the spirit realm, Kai reveals that it only works on mortals, not a spirit warrior like himself. Kai gains the upper hand in their fight, but Po uses the Wuxi Finger Hold on himself while gripping Kai around the neck, transporting them both to the spirit realm. They fight again, and Kai subdues Po and begins to steal his chi. Using what they learned from Po, his friends and family use their chi to empower him. Po harnesses their chi to create a giant dragon figure with which he overloads Kai, destroying him and restoring all of the fallen masters to normal. In an ethereal golden pond, Oogway appears to Po and informs him that his journey as the Dragon Warrior has come full circle, declaring Po to be his successor. He reveals that he sent Li to find Po. Po chooses to return to the mortal world, and brings with him a mystic jade yin-yang staff bestowed by Oogway. He and his extended family all return to the valley, where they continue practicing kung fu and chi. Bryan Cranston as Li Shan. Cranston replaces Fred Tatasciore, who had voiced Li Shan in Kung Fu Panda 2. Dustin Hoffman as Master Shifu. J. K. Simmons as Kai. Angelina Jolie as Master Tigress. Lucy Liu as Master Viper. Jackie Chan as Master Monkey. Seth Rogen as Master Mantis. David Cross as Master Crane. James Hong as Mr. Ping. Kate Hudson as Mei Mei. Randall Duk Kim as Grand Master Oogway. Barbara Dirikson as Grandma Panda. Jean-Claude Van Damme as Master Croc. Fred Tatasciore as Master Bear. Tatasciore briefly voiced Li Shan in Kung Fu Panda 2. Stephen Kearin as Master Chicken. Wayne Knight as Big Fun, Hom-Lee. Knight had voiced one of the warriors in the prologue of Kung Fu Panda. Knox Jolie-Pitt as Ku Ku. Zahara Jolie-Pitt as Meng Meng. Shiloh Jolie-Pitt as Shuai Shuai. Liam Knight as Lei Lei. Mike Mitchell as Male Palace Goose, Smart Panda Villager. Kelly Cooney as Female Palace Goose. Mick Wingert as Farmer Goose, Farmer Rabbit. In 2010, DreamWorks Animation CEO Jeffrey Katzenberg announced that the Kung Fu Panda franchise was planned to have six movies, or "chapters", altogether. In July 2012, Kung Fu Panda 3 was officially confirmed by Bill Damaschke, DWA's chief creative officer. The film was made as a co-production between DreamWorks Animation and Oriental DreamWorks, a Shanghai-based studio, founded in 2012 as a partnership between DreamWorks Animation and Chinese companies. One third of the film was made in China, and the rest in the United States, at DWA. This was the first time that any major American animated feature film had been co-produced with a Chinese firm. The filmmakers worked closely with SAPPRFT to ensure the film's release in China. As a film with a co-production status in China, it allowed the production companies to circumvent the country's strict import quota and take a greater share of box-office revenue than imported films. To ensure the film's success in China, in addition to the English version, the Chinese version of the film was also fully animated, making them the only versions that will have the characters' lips synchronized with their voices. Kung Fu Panda 3 saw the crew from the second film reunite, including director Jennifer Yuh Nelson, producer Melissa Cobb, screenplay writers Jonathan Aibel and Glenn Berger, and Guillermo del Toro as executive producer. Initially, Nelson was directing the film alone, but by February 2015, Alessandro Carloni had joined her as a co-director. According to the report, Carloni, who was an animation supervisor on the first film and a story artist on the second, joined Nelson following her request to strengthen "the director's bench" to ensure that the film is completed in a timely manner. On April 9, 2013, DreamWorks Animation announced that Rebel Wilson, Bryan Cranston, and Mads Mikkelsen had joined the cast of the film. By April 2015, J.K. Simmons had replaced Mikkelsen, whose character had been rewritten. Five months later, Wilson was replaced by Kate Hudson due to an extended production schedule. The studio had to reanimate previously completed scenes to reflect Hudson's interpretation of the character. The film's antagonist, Kai, is the first supernatural villain of the Kung Fu Panda series. Described by del Toro as "the most formidable villain yet," the creators wanted him to stand apart from his predecessors. Nelson reasoned: "You can't go brawler because Tai Lung was brawler. You can't go smarter because Shen was smarter. Where can you go? You have to go supernatural, bigger, and even more intimidating." On July 25, 2014, it was announced that Hans Zimmer would return to score the film. The score includes performances from renowned Asian musicians such as Chinese pianist Lang Lang, Chinese cellist Jian Wang, erhu musician Guo Gan, and Taiwanese pop singer Jay Chou and Canadian-Taiwanese young singer Patrick Brasca. The soundtrack album was released on January 22, 2016. John Powell, who collaborated with Zimmer on the first two films, did not return for the third instalment. In September 2012, it was announced that Kung Fu Panda 3 would be released on March 18, 2016. On April 9, 2013, the film's release date was moved forward to December 23, 2015. In December 2014, the film was moved back to its original release date of March 18, 2016, to avoid competition with Star Wars: The Force Awakens. In April 2015, the release date was once again shifted, this time to January 29, 2016. AMC Theatres partnered with Fox and DWA to play the movie in Mandarin at seven theaters and in Spanish at 14 locations in the U.S and Canada meaning there will be a mix of subtitled and dubbed formats of Kung Fu Panda 3. This will mark the first time that AMC is playing a major theatrical release in dubbed/subtitled Mandarin. The film had a day-and-date release starting from January 28 in South Korea, Russia, Ukraine, Jamaica and Puerto Rico and China and the U.S. and Canada on January 29, 2016. Other markets will follow on March and April. According to Deadline Hollywood, the strategy behind such a staggered release was to take advantage of certain opportunistic dates which presented themselves such as the Chinese New Year in February for China. Kung Fu Panda 3 grossed $143.5 million in North America and $377.6 million in other territories for a worldwide total of $521.2 million, and is the lowest-grossing film in the series. According to Deadline Hollywood, the film made a net profit of $76.65 million, when factoring together all expenses and revenues for the film, making it one of the top twenty most profitable release of 2016. In the United States and Canada, early tracking suggests the film would open to about $40–45 million from 3,955 theaters with Box Office Mojo reporting as high as $53 million opening, which is on par with Kung Fu Panda 2's $47.7 million opening in 2011 but much lower than the original film's $60.2 million opening in 2008. However, DreamWorks Animation and Fox are being more conservative suggesting a "mid $40 million" opening. Paul Dergarabedian, senior analyts at Rentrak said the film "should land somewhere between the first two installments" noting that after moviegoers – mostly from the East Coast – were affected by the 2016 United States blizzard, patrons, mostly families, would be on the look-out for entertainment movies which Kung Fu Panda 3 delivers. On January 27, two days before the film's release, Fandango reported that Kung Fu Panda 3 was the top advance ticket seller for the weekend, outstripping previous DWA films Home as well as Kung Fu Panda 2 at the same point in their sale cycles. Box office pundits also noted that the film didn't face any serious competition with its counterparts of newly released films such as The Finest Hours and Fifty Shades of Black, as well as holdovers The Revenant and Star Wars: The Force Awakens, as all are expected to gross around $10 million. In North America, Kung Fu Panda 3 topped the box office in its debut weekend with $41.3 million, which made it the best opening weekend for animated film in January and the third highest weekend debut ever for the month. It retained the No. 1 spot at North American box-office during its second weekend, by grossing $21.2 million. In China, expectations were high for the film with Nancy Tartaglione of Deadline Hollywood reporting a bigger opening weekend than the U.S. and a bigger total gross. Conservative estimates for its China opening were at $35 million and rising to well upwards of $50 million. Even before the film's official release in China, it was already projected to emerge as the highest-grossing animated film there, a record currently held by Monkey King: Hero Is Back ($153 million), since it had the added benefit of opening a week before the Chinese New Year, as well as Valentine's Day and debuting amidst the school holidays, the Lunar New Year blackout period in which foreign films are banned from entering the state meaning lesser competition and longer legs, and since it has the special privilege to run throughout the period and is also not limited to running 30 days in theaters. The film was released in China on January 22, 2016 in a limited release, a week before its United States release. It had a 3-hour special sneak preview where it earned $6.4 million from two different versions of the film topping the daily box office charts. This broke the previous Saturday preview record held by Surprise: Journey to the West. Buoyed by good word-of-mouth, it had a single day opening of $16.3 million which is the biggest of 2016 thus far and uncluding previews from its Saturday showings earned a total of $23.1 million which is one of the biggest opening and single day gross in China. Kung Fu Panda 3 has received generally positive reviews from critics. On Rotten Tomatoes, the film holds a rating of 87%, based on 171 reviews, with an average rating of 6.88/10. 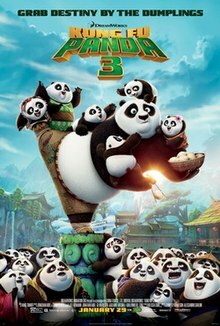 The site's critical consensus reads, "Kung Fu Panda 3 boasts the requisite visual splendor, but like its rotund protagonist, this sequel's narrative is also surprisingly nimble, adding up to animated fun for the whole family". On Metacritic, the film has a score of 66 out of 100, based on 34 critics, indicating "generally favorable reviews". IGN gave the film score of 8.5 out of 10, saying, "Kung Fu Panda 3 offers a fun-filled, action-packed conclusion to DreamWorks' endearing animated series." Screen Rant awarded it 2.5 out of 5, saying "At times, it's a beautiful movie, filled with likable characters, as well as digestible gags, that should keep kids smiling and giggling – but, with a plethora of more ambitious animated options out there, passable might not justify the money (or time) required for a viewing." Glenn Kenny of RogerEbert.com awarded it 3 out of 4 stars, saying "In spite of its abundant action – and for all the interspecies mashups, this is as much an action-adventure animated movie as it is a funny-animal animated movie – is a pretty relaxing experience for the adult viewer." Entertainment Weekly awarded it a score of B, saying it was "Just complicated enough to reward steady viewers and just simple enough for parent escorts to enjoy without much prior knowledge." The Hollywood Reporter awarded it a positive review, saying "While the storyline, in which Jack Black's dumpling-downing Dragon Warrior is reunited with his biological father, doesn't quite fulfill its prophecies, dramatically speaking, visually speaking it's all quite impressive — one of those very rare animated features that completely justifies its 3D glasses." The Escapist awarded it 3 out of 5, saying "It's a perfectly fine film, and if all you want is "more of the same," it won't disappoint." Forbes awarded it a mildly positive review, saying "While visually gorgeous and generally entertaining, this third installment of the DreamWorks Animation franchise is a comedown from the first two superb entries." Variety also awarded it a positive review, saying "A winning lightness of touch prevails in this delightful continuation of the durable DreamWorks franchise." Kung Fu Panda: Showdown of Legendary Legends is a single and multiplayer RPG martial arts video game that features characters from all three Kung Fu Panda films. Developed by Vicious Cycle Software and published by Little Orbit, the game was released on December 1, 2015 for Microsoft Windows, Xbox 360, PlayStation 3, Nintendo 3DS, Xbox One, and PlayStation 4. The Wii U version was released on December 15, 2015. On December 3, 2010, DreamWorks Animation CEO Jeffrey Katzenberg said that if it's possible perhaps the series could see three more sequels after Kung Fu Panda 3, bringing it to a six-film series. In January 13, 2016, Collider asked the filmmakers of Kung Fu Panda 3 about the possibility of a fourth film. Co-director Jennifer Yuh Nelson said, "It’s one at a time. We want to make this a perfect jewel, and then we’ll see what happens after that". Co-director Alessandro Carloni said, "With the sequels, we don’t want to try to have them feel open-ended. We want it to feel like a completed journey, and we feel this movie does. And then, if a fantastic story presents itself, great". On August 2, 2018, when asked on the possibility of Kung Fu Panda 4, Nelson replied that she doesn't know as she always saw the series as a trilogy, but that she is open for a fourth installment as long the franchise focuses on Po. ^ a b "Hans Zimmer to Return for 'Kung Fu Panda 3'". Film Music Reporter. July 25, 2014. Retrieved August 1, 2014. ^ "KUNG FU PANDA 3 [2D] (PG)". British Board of Film Classification. January 8, 2016. Retrieved January 8, 2016. ^ a b c "Kung Fu Panda 3 (2016)". Box Office Mojo. Retrieved January 27, 2016. ^ Flores, Terry (January 16, 2016). "DreamWorks Animation Celebrates 'Kung Fu Panda 3' With Chinese Performers, Dragons and Noodles". Variety. Retrieved October 14, 2017. ^ a b c d e f DreamWorks Animation (April 9, 2013). "DreamWorks Animation Packs A Powerful Punch With New Cast Additions For Kung Fu Panda 3" (Press release). PR Newswire. Retrieved January 30, 2014. ^ a b Cooke, Nick (January 2015). "Living the Dream". Toy World. Retrieved March 11, 2015. ^ Alexander, Bryan (June 10, 2015). "Sneak peek: 'Panda 3' amps up bear count". USA Today. Retrieved June 11, 2015. ^ a b c d e f Chitwood, Adam (April 23, 2015). "Synopses Revealed for KUNG FU PANDA 3, JOY, THE MARTIAN, and More". Collider. Retrieved April 25, 2015. ^ Alexander, Bryan (June 18, 2015). "'Kung Fu Panda 3' unveils trailer, villain". USA Today. Retrieved June 18, 2015. ^ Gallagher, Brian (December 11, 2014). "'Kung Fu Panda 3' Gets New 2016 Release Date". MovieWeb. Retrieved March 29, 2015. ^ a b c Kit, Borys (September 4, 2015). "Kate Hudson to Replace Rebel Wilson in 'Kung Fu Panda 3' (Exclusive)". The Hollywood Reporter. Retrieved September 4, 2015. ^ "Kung Fu Panda 3". DreamWorks Animation. Retrieved June 17, 2015. ^ a b O'Hara, Helen (December 3, 2010). "Katzenberg Talks DreamWorks Sequels". Empire. Archived from the original on May 31, 2011. Retrieved September 7, 2011. ^ Oldham, Stuart; Maxwell, Erin (July 12, 2012). "Comic-Con: D'Works fires up 'Kung Fu Panda 3'". Variety. Retrieved July 12, 2012. ^ "DreamWorks Animation SKG Management Discusses Q3 2012 Results - Earnings Call Transcript". Seeking Alpha. November 1, 2012. Retrieved November 26, 2012. ^ a b Tsui, Clarence (June 17, 2013). "'Kung Fu Panda 3' to Begin Production in August". The Hollywood Reporter. Retrieved June 17, 2013. ^ DreamWorks Animation (August 6, 2012). "Rising Dreams in the Orient: Oriental DreamWorks To Establish Headquarters in Xuhui" (Press release). PR Newswire. Archived from the original on December 4, 2012. Retrieved December 10, 2014. ^ Michael Cieply; Brooks Barnes (January 14, 2013). "To Get Movies Into China, Hollywood Gives Censors a Preview". The New York Times. Retrieved January 15, 2013. ^ Jaafar, Ali (January 23, 2015). "'Kung Fu Panda 3′ To Get China Co-Production Status". Deadline Hollywood. Retrieved March 7, 2015. ^ Frater, Patrick (April 19, 2015). "Jeffrey Katzenberg Pumps Up 'Panda 3,' Puts Down Deal Talk". Variety. Retrieved April 19, 2015. ^ a b DreamWorks Animation SKG (September 9, 2012). "New Distributor Twentieth Century Fox Unveils DreamWorks Animation's Release Slate Through 2016" (Press release). PR Newswire. Retrieved September 5, 2015. ^ Patten, Dominic (February 24, 2015). "'Kung Fu Panda 3′ Gets Co-Director As DWA Looks To Shore Up Franchises". Deadline Hollywood. Retrieved February 28, 2015. ^ den Hartog, Max (April 27, 2015). "Mads Mikkelsen Leaves 'Kung fu Panda 3′ Voice Cast + More New Details!". Rotoscopers. Retrieved April 27, 2015. The studio confirmed that Mads Mikkelsen is indeed no longer on the project, but because his character has been rewritten. ^ a b c Smith, C. Molly (July 28, 2015). "Kung Fu Panda 3 filmmaker explains why Kai is the series' first supernatural villain". Entertainment Weekly. Retrieved September 5, 2015. ^ Chitwood, Adam (November 12, 2012). "Guillermo del Toro Talks Puss in Boots 2, Kung Fu Panda 3 & Trollhunters; Says Panda 3 Has the 'Most Formidable Villain in the Series'". Collider.com. Retrieved November 12, 2012. ^ "'Kung Fu Panda 3' Moves Out of 2015 to Avoid 'Star Wars'". The Hollywood Reporter. December 11, 2014. Retrieved December 11, 2014. ^ Rebecca Ford (April 14, 2015). "'Kung Fu Panda 3' Release Date Moves Up Two Months". The Hollywood Reporter. (Prometheus Global Media). Retrieved April 15, 2015. ^ a b c d Anthony D'Alessandro (January 27, 2016). "'Kung Fu Panda 3' Will Dig Box Office Out Of The Snow With $40M+ Opening – Preview". Deadline Hollywood. Retrieved January 28, 2016. ^ a b c d e Nancy Tartaglione (January 27, 2016). "'Kung Fu Panda 3' China Debut To Dominate U.S. In Day-And-Date Release". Deadline Hollywood. Retrieved January 28, 2016. ^ a b Brad Brevet (January 28, 2016). "Weekend Preview: 'Kung Fu Panda 3' To Top 'Fifty Shades of Black' and 'Finest Hours'". Box Office Mojo. Retrieved January 29, 2016. ^ Mike Fleming Jr (March 22, 2017). "No. 16 'Kung Fu Panda 3' Box Office Profits – 2016 Most Valuable Movie Blockbuster Tournament". Deadline Hollywood. Retrieved March 23, 2017. ^ a b Pamela McClintock (January 27, 2016). "Box-Office Preview: 'Kung Fu Panda 3' Prepares to Capsize 'The Finest Hours'". The Hollywood Reporter. Retrieved January 28, 2016. ^ a b Dave McNary (January 27, 2016). "'Kung Fu Panda 3' to Deliver a Punch to the U.S. Box Office". Variety. Retrieved January 28, 2016. ^ Anthony D'Alessandro (February 1, 2016). "'Kung Fu Panda 3' Gets Leg Up On Fierce 1st Quarter & Scores Record January Toon Opening – Monday B.O. Postmortem". Deadline Hollywood. Retrieved March 11, 2019. ^ Anthony D'Alessandro (February 11, 2016). "At the Box Office: 'Kung Fu Panda 3' keeps top spot". Associated Press. Retrieved March 11, 2019. ^ a b c Jonathan Papish (January 29, 2016). "On Screen China: Let the Bear Hug Commence—'Kung Fu Panda 3'". China Film Insider. Retrieved January 29, 2016. ^ Patrick Brzeski (January 25, 2016). "China Box Office: 'Kung Fu Panda 3' Earns Impressive $6.4M in Previews". The Hollywood Reporter. Retrieved January 26, 2016. ^ Silvia Wong (January 26, 2016). "China Box Office: 'Star Wars' holds lead; 'Kung Fu Panda 3' previews strongly". Screendaily. Retrieved January 28, 2016. ^ Scott Mendelson (January 29, 2016). "'Kung Fu Panda 3' China Box Office: A Huge $16.3M Debut For A Boffo $23.1M Total". Forbes. Retrieved January 29, 2016. ^ "Kung Fu Panda 3". rottentomatoes.com. Retrieved January 29, 2016. ^ "Kung Fu Panda 3". Metacritic. Retrieved January 29, 2016. ^ "Kung Fu Panda 3 Review". Screen Rant. Retrieved February 2, 2016. ^ Kenny, Glenn. "Kung Fu Panda 3 Movie Review & Film Summary (2016) | Roger Ebert". www.rogerebert.com. Retrieved February 2, 2016. ^ "'Kung Fu Panda 3': EW review". Entertainment Weekly's EW.com. Retrieved February 2, 2016. ^ "'Kung Fu Panda 3': Film Review". The Hollywood Reporter. Retrieved February 2, 2016. ^ "Kung Fu Panda 3 – Is the Third Time the Charm for Fat Pandas?". The Escapist. Retrieved February 2, 2016. ^ Mendelson, Scott. "Review: 'Kung Fu Panda 3' Is A Merely Good Entry In A Great Franchise". Forbes. Retrieved February 2, 2016. ^ A winning lightness of touch prevails in this delightful continuation of the durable DreamWorks franchise. ^ "ASCAP Award". ImdB. May 14, 2017. Retrieved January 10, 2018. ^ Foster, Elizabeth (October 19, 2016). "Horrible Histories, TrueTube lead BAFTA Children's noms". Kidscreen. Retrieved October 23, 2016. ^ "2016 Children's BAFTA Kids' Vote - Film". British Academy of Film and Television Arts. November 21, 2016. Retrieved December 2, 2016. ^ "2017 Awards". Georgia Film Critics Association. January 8, 2018. Retrieved January 8, 2018. ^ Ceron, Ella (February 7, 2018). "GTA 17 Nominees (2016)". Golden Trailer Awards. Retrieved June 5, 2016. ^ "Justin Timberlake and Kevin Hart Lead Nickelodeon's Kids' Choice Awards Nominations". Variety. February 24, 2017. Retrieved February 24, 2017. ^ "2016 MTV Movie Award Winners: See The Full List". MTV News. Retrieved April 11, 2016. ^ "The 42nd Annual Saturn Awards nominations are announced for 2016!". Saturn Awards. February 24, 2016. Retrieved March 4, 2016. ^ Little Orbit (May 4, 2015). "Little Orbit Kicks Off Totally Epic Kung Fu Panda: Showdown of Legendary Legends Video Game". PR Newswire iReach. Retrieved August 1, 2015. ^ a b Little Orbit (December 1, 2015). "Kung Fu Panda: Showdown of Legendary Legends Video Game Launches Today" (Press release). Gamasutra. Retrieved December 5, 2015. ^ Radish, Christina (January 13, 2016). "'Kung Fu Panda 3′: Directors, Producer on Shaping a Worthy Sequel and Po's Future". Collider. Retrieved January 14, 2016. ^ Wakeman, Gregory (August 2, 2018). "Will there be a 'Kung Fu Panda 4'? Here's what director Jennifer Yuh Nelson told us". Metro. Retrieved February 5, 2019.